This collaboration between ETH and the Disney empire’s research arm is a ultra-light robot that can roll across horizontal surfaces and also transition and climb walls. The robot has four wheels with one steerable set, but its secret sauce is the two propellers gimbaled on its back. Using these propellers it can move itself across the ground, but also, when approaching a wall, provide enough thrust to overcome the gravity vector. Naturally, the lighter the robot, the less force will be needed to keep it on the wall. That’s why the frame is made from carbon fiber corrugated sandwich panels. The motors, batteries, and controllers are all also light and small. We liked how the robot was, apparently, using its propellers to provide additional stability even while on the ground. There is a video after the break, and more information can also be found on the Disney Research webpage. The team over at [Braille Skateboarding] is willing to ride just about anything. 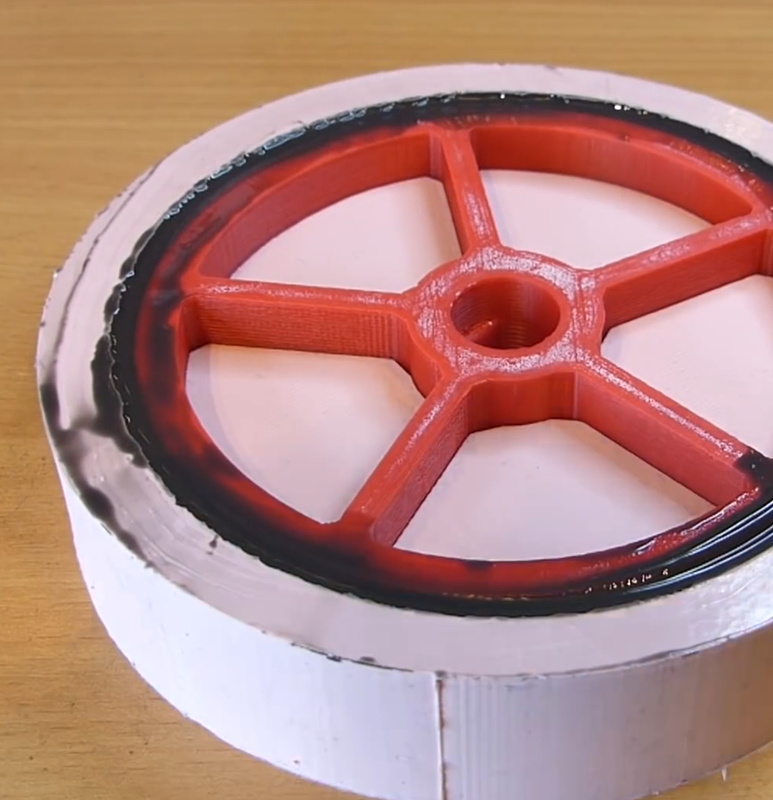 This week they’re testing out 3D printed skateboard wheels. We’re not just talking rolling around here, the [Braille] team takes their experiments out to the skate park and gives them to the locals to test out. Tail whips, jumps, ollies, and grinds were on the agenda. The skaters were a bit apprehensive, as this is the third time they’ve tested 3D printed wheels. The first set shattered upon landing a jump. That set appears to have been made from PLA with about 10% infill. The second set were made from NinjaFlex, which had no shattering problems, but was so squishy that the wheels simply flattened under the weight of the riders. The third set, printed by [Nick Lindenmuth] work great. They have a bit of give, but don’t shatter. We’re guessing this set is either ABS or one of the more exotic filaments. It’s pretty amazing that 3D printers are capable of spitting out wheels that not only handle the load of rider, but the shock load of coming down from jumps and tricks. Check out the video after the break. If you want to see more skateboard projects, check out this skateboarding themed Hacklet! [Sugapes] always wanted to cut a few corners and build a really, really cheap 3D printer, but the idea of using linear actuators – pricing them, sourcing them, and the inevitable problems associated with them – scared him away. One day, he realized that moving in a plane in the X and Y dimensions wasn’t hard at all; cars and robots do this every day. Instead of moving a 3D printer bed around with rods and pulleys, [Sugapes] is moving his 3D printer around with wheels. It’s different, it’s interesting, and it’s the perfect project to show of his creativity for The Hackaday Prize. The drive system [Sugapes] is using is called a holonomic drive system. In his build, three omnidirectional wheels are attached to continuous rotation servos, each of them mounted 120 degrees apart. The print bed is simply placed on these wheels, and with the right control algorithms, [Sugapes] can move the bed in the X and Y axes. With an extruder on a Z axis above the bed, this setup becomes a 3D printer with a theoretically unlimited XY build axis. Pretty clever, huh? There are a few problems [Sugapes] will have to overcome to turn this project into a proper printer. The omnidirectional wheels aren’t the best at transferring movement to the bed, so a quartet of USB optical computer mice are being used for a closed loop system. [Sugapes] put up a video of his project, you can check that out below. Of all the free parts up for grabs at a friend’s house, nobody wanted the scrap wheelchair wheels: including [Eric]. That is, of course, until he spontaneously decided to try something a bit crazy and take on a bizarre yet remarkably imaginative hubless wheel bike build. After attaching the wheelchair’s rim and its affixed handrail to the rim on his bike, [Eric] mounted pairs of rollerblade wheels to a separate piece of metal that essentially act as bearings. As the build progresses, the bike is further refined. More rollerblade wheels, a giant sprocket, and a pile of machined aluminum pieces. The valve stem for the tire had to be relocated to allow the wheel to spin freely. The finished product is a stunning bicycle, which [Eric] later revisited, updating the rollerblade wheels to precision-lathed plastic (specifically UHMWPE) rollers. Make sure you watch the video of the Hubless Horseman in action. If, for some reason, your only prior exposure to hubless wheels is the TRON light cycle or [Kirk’s] motorcycle from the Star Trek reboot, do yourself a favor and check out their inventor, Franco Sbarro.